CertainTeed Colors, Cool Colors Roofing & Cal Vintage. A Top Sacramento Area Roofing Contractor for install, repair, replace contracts. Get a Free Estimate. Solar reflective shingles are defined as having surfaces that primarily reflect considerably more IR radiation than normal roof surfaces. Infrared radiation is a spectrum of light that generates significant amounts of heat on roof surfaces. Solar reflective shingles are designed specifically to reduce the absorption of the suns infrared radiation by reflecting IR rays off the surface of the roof thus not allowing the heat to be transferred to the interior of the structure (i.e. the attic under the roof). In addition to the potential energy saving benefits that solar reflective shingles can have for a building, research on the degradation of roofing membranes over a number of years have shown that heat from the sun is one of the most potent factors impacting durability. High temperatures and large variations; seasonally or daily, at the roofing level are detrimental to the longevity of roof surfaces. Reducing the extremes of temperature change will reduce the incidence of damage to roofing systems. Using solar reflective shingles and solar reflective roofing products that reflect ultraviolet and primarily infrared radiation will reduce damage caused by u/v and heat degradation. Landmark Solaris® Solar Reflective Shingles from CertainTeed Roofing are ecologically smart, beautifully durable, and architecturally ideal for sunny climates or anywhere solar heat is a challenge. Landmark Solaris is a steep-slope, solar reflective asphalt roofing shingle with advanced roofing granules that reflect solar energy and radiate heat far better than traditional roofing shingles, reducing your roof's temperature in the summer. Landmark Solaris® Gold is a durable, high-performance cool roof asphalt shingle ideal for climates and locations where solar heat is a challenge. This wood shake-inspired, solar-reflective asphalt shingle reflects solar energy and radiant heat far better than traditional roofing shingles, keeping your home cooler in hot months and your roof looking great all year long. Landmark PRO is engineered to outperform ordinary roofing in every category, keeping you comfortable, your home protected, and your peace-of-mind intact for years to come with a transferable warranty that's a leader in the industry. With Max Def colors, a new dimension is added to shingles with a richer mixture of surface granules. You get a brighter, more vibrant, more dramatic appearance and depth of color. And the natural beauty of your roof shines through. The innovative technology of Landmark PRO Solaris® produces a shingle that reflects solar energy in a maximum definition color palette with rich hues and stunning dimensionality. Landmark PRO Solaris shingles are manufactured using the same high standards as all CertainTeed roofing products and are covered by the same superior warranty protection. Landmark Solaris™ PLATINUM from CertainTeed Roofing is a brilliant energy-saving breakthrough that puts cool roof technology to work. 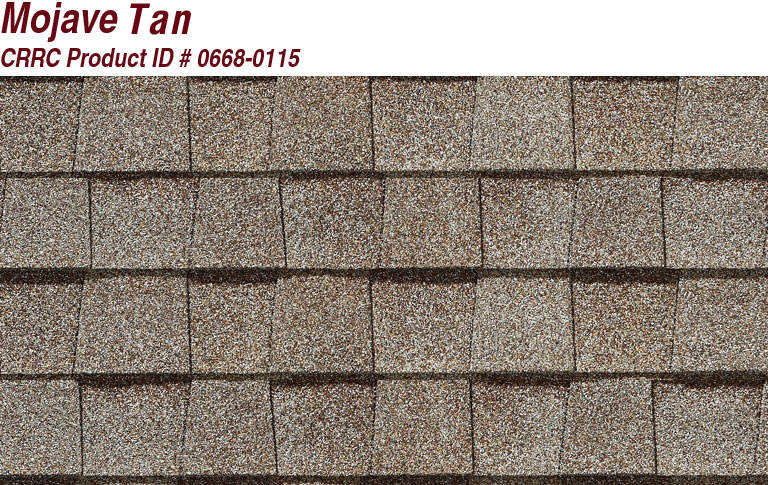 Landmark Solaris is a steep-slope, solar reflective asphalt roofing shingle which contains advanced colored granules that can reflect solar energy and radiate heat far better than traditional roofing shingles, reducing your roof's temperature in the summer. With Landmark Solaris PLATINUM, you get a fresh, bright color palette but with an industry-leading solar reflectance value of over 40%. With its heavyweight construction and meticulous design, Arcadia Shake provides the most authentic replication of split wood shake roofing available today. Made from four layers of highly-refined asphalt, this luxury laminate shingle is certified as meeting the industry's highest fire resistance rating and is unaffected by the rot and decay that plague real wood shake. Arcadia shake stands out as the smart and safe choice for discriminating homeowners seeking to capture the iconic allure of classic roofing. Rated by the Cool Roofing Rating Council (CRRC) for cool roofs and can be used to comply with the 2016 California Title 24 Part 6 Cool Roof Requirements. *To learn more about CertainTeed products, please click on their logo and go directly to their website.